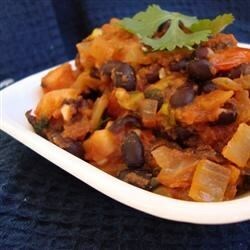 "Fresh herbs gives a hot Spanish flair to this black bean dish. It's a favorite from my Argentine boyfriend. This is traditionally served over rice." This was okay. It was a lot thicker than I expected. I guess that's how people are able to make it into burritos the next day. I will try that tomorrow. I only put one onion, and it was a lot! Picked up another can of black beans just so i can make this again. It was very good. Great side dish for any mexican/latin meal.Followed recipe exactly.